Boisterous energy flows out as you open the door to Bill Pickle’s Tap Room – people laughing and cheering, clinking glasses, and the sound of pop country music echoing throughout the bar. Since its start Pickle’s has always been a lively place where a good time is just around the corner. The restaurant sports bar is named after the infamous bootlegger Bill Pickle, a notorious figure who distributed party supplies to the campus in the wee hours of the night during prohibition. Although prohibition is over, Bill Pickle’s rebellion is still celebrated daily at this hot spot on Allen St.
By day Pickle’s is a restaurant sports bar where locals and students alike come for some good food and refreshing drinks. It’s the perfect spot for a casual business lunch or a family outing – especially in the warm weather when Pickle’s opens its windows allowing the breeze in. By night, the restaurant turns into an energetic bar offering a great happy hour and an even better time. Pickle’s has lively entertainment every night of the week, but is most known for its Country Music Night every Tuesday, and Team Trivia and Sons of Resonance performing on Wednesdays. 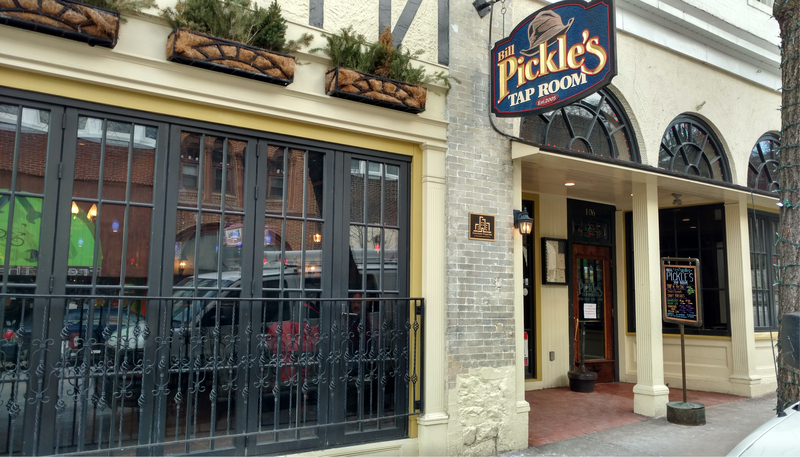 Located in the heart of Downtown, where it shares the corner (and a kitchen) with The Corner Room, Pickle’s is a stone’s throw from both the center of Penn State’s campus and the hustle and bustle of Downtown State College. It’s famous for its savory peanut butter wings, a recipe you can’t find anywhere else in town. Additionally, Pickle’s offers a wide variety of delicious food from starters, soups and salads to baskets, grinders, specialty sandwiches and burgers. Enjoy the MOS burger topped with sautéed mushrooms, onions and melted Swiss cheese! At a lively restaurant sports bar you need to have a lively staff, and Pickle’s doesn’t disappoint. The staff helps you celebrate the good times with constant jokes and great service, even when the bar is crowded. Mo the GM has been there since the beginning and loves to catch up with the locals, students and anyone else who stops by. Whether you’re looking for a rocking night out or a breezy lunch overlooking Allen Street, Pickle’s has it all. 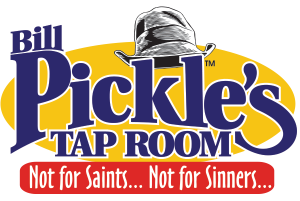 To learn more about the entertainment, menu and specials or to brush up on the history of Bill Pickle himself, visit the Pickle’s website. 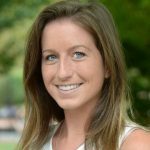 Elyssa Ganser is a senior majoring in Public Relations at Penn State. She is excited to see what lies ahead as she starts this new chapter in her life. Elyssa discovered her passion for writing after working for School Nutrition Magazine last summer, where she wrote articles and edited content for upcoming editions of the monthly magazine.